Which Tires Will Your Car Need for the Winter? The winter season creates various challenges for drivers. You can ask Nelson Kia about high-performance tires that are optimized to roll on slippery roads. Studdable tires are engineered to maximize traction on highways that are coated with ice or snow. Such tires have special formulations of rubber and other composite materials for optimum handling on low-friction highways. In fact, the patented materials behave differently according to the ambient temperatures. 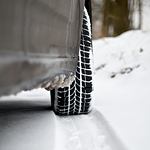 For example, some winter tires might become more rigid for better handling on hard surfaces. If the air temperature is above 32 degrees Fahrenheit, the tires might become slightly softer and more flexible. In addition to having unique tread patterns for optimum traction, studdable tires also maintain a uniform gauge pressure in a wide range of temperatures. However, you might still need to pump a little bit of air into the tires when the outside temperature drops below 20 degrees.